Secure your garbage cans at all times or store garbage indoors. Avoid feeding pets outside. Remove sources of pet food and water. If feeding pets outside is necessary, remove the bowl and any leftover food promptly. Cover Ripe fruit and vegetables at night or enclose garden/fruit trees with a coyote-proof fence to prevent access by hungry coyotes. Pick up windfall fruit/vegetables daily. Cats and small dogs should not be left out after dark unless enclosed in a coyote-proof enclosure. 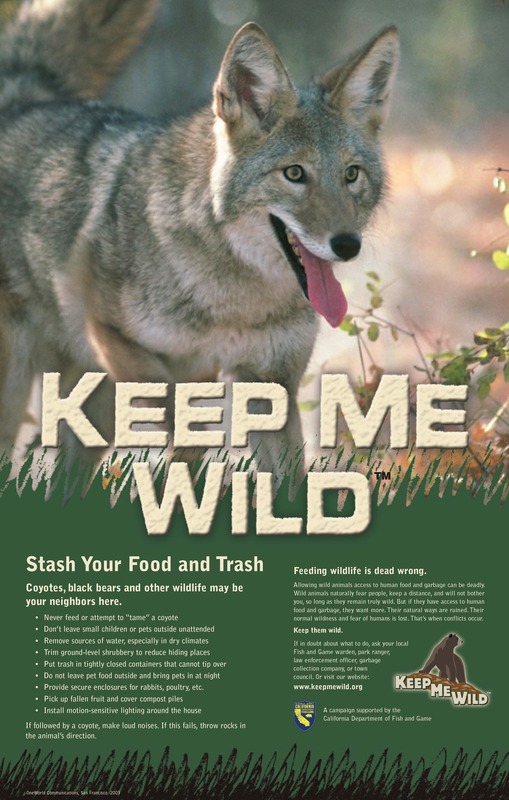 Never hand-feed or otherwise deliberately feed a coyote. Fences should be constructed which are at least 5 ½ feet tall to exclude coyotes. These can be made of solid wood, cement blocks, or bricks. All fences should have some short of galvanized wire apron buried at least 4 to 6 inches in the ground, which extends out from the fence at least 15 to 20 inches. The apron should be securely attached to the bottom of the fence. Clear brush and vegetation from backyards and adjacent areas to eliminate habitat for prey. Landscaping should be pruned on a regular basis to remove hiding cover used by coyotes to stalk domestic pets. If cats cannot be contained indoors, and predation is viewed as a problem, posts can be installed in open space areas, which provide an escape for the cats. These posts should be at least 7 feet tall, made of material that the cat can climb, and have enough space on top for the cat to sit. FENCINGBRUSH and VEGETATIONPlease remember that coyotes are wild animals, much like bears, raccoons, possums, skunks, hawks, and falcons. The City of Alhambra is their home too, and by following the preventative measures described above, ensuring that you do not feed or approach them, keep your pets and family safe and secure, we can all live together in our community. And finally, if they do not run away from you, try to scare them away by making loud noises or throwing rocks at their direction. Your efforts will help reduce the amount of coyote sightings in the City of Alhambra.